An astonishing singer-songwriter and guitarist, Laura Marling pens cathartic, conversational songs that deftly shift between ferocity and fragility. Just 24 years old, she's already released four critically acclaimed albums, three of which have been nominated for the Mercury Prize. She won the Brit Award in 2011 as Best Female Solo Artist and was nominated two other times for that honor. 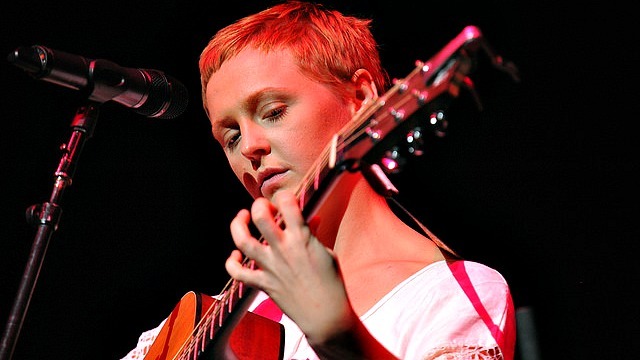 In 2014, Laura Marling brought her beautifully etched songs to Holiday Cheer for FUV with Conor Oberst and Friends at the Beacon Theatre on December 8, 2014, joining Natalie Merchant, The Lone Bellow, The Felice Brothers and Jonathan Wilson. Like Conor Oberst, Laura's career began as a wise-beyond-her-years teenager, but she's always written with an uncanny maturity. Her lyrics are both covertly autobiographical and not, dissecting the complex nature of relationships with intuitiveness, vulnerability and sagacity. As we've observed in Laura's many visits to WFUV, especially her FUV Live concert at St. Ann's Church in Brooklyn on a blistering hot September night last year (the day she was nominated for her third Mercury Prize), she doesn't merely perform her songs, but seems to experience them in that moment. Her most recent album, 2013's Once I Was An Eagle, flows seamlessly from track to track, a river of introspection, keen observation, wit and even hope rising from heartbreak. Raised in pastoral Hampshire, England where her father owned a recording studio, Laura moved to London at 16. There she became a part of the fast-rising folk-rock movement that also spawned Noah and the Whale and Mumford and Sons (and yes, she once dated the frontmen of both bands). Laura has since relocated to Los Angeles—a surprising but logical move for a songwriter who has been compared to many Laurel Canyon troubadours, notably Joni Mitchell. Laura will release her fifth album, Short Movie, in March of 2015. At Holiday Cheer for FUV, she played a new song from that forthcoming album, called "Strange," as well as "Devil's Spoke" from 2010's I Speak Because I Can. We've been entranced by Laura Marling for the past six years—her very first Stateside radio appearance was with Vin Scelsa on WFUV back in January 2008—and we are so pleased that she was a part of Holiday Cheer for FUV with Conor Oberst and Friends.